I love oriental style art for its beauty & tranquility. While I was hosting Cards for the Troops events, most of my personal art got put on the back burner. Now that the CFT ministry has retired, I can again pursue some of my favorite art styles. 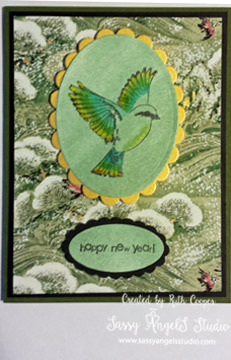 I sent a non-oriental holiday card so made a New Year Card in the oriental style. The bird is hand painted with Twinkling H2O’s & is stamped on hand colored background paper. The ornament was a little rough on the backside but overall came out pretty well. 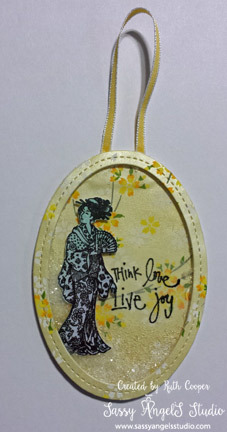 It’s a shaker ornament & was fun to make. I wanted to create an ornament that could be displayed all year if the recipient wanted instead of just at Christmas. I am looking forward to creating more oriental art this year. And being on the receiving end in the swaps is always a joy.